On Monday (the 16th) I am going to be on live TV talking about the conjunction of Venus and Mars, which will happen on the 21st (Saturday). In the western sky, just after sunset, you will see Venus and Mars come very close together, and it is this chance alignment as seen from Earth that we call a conjunction. 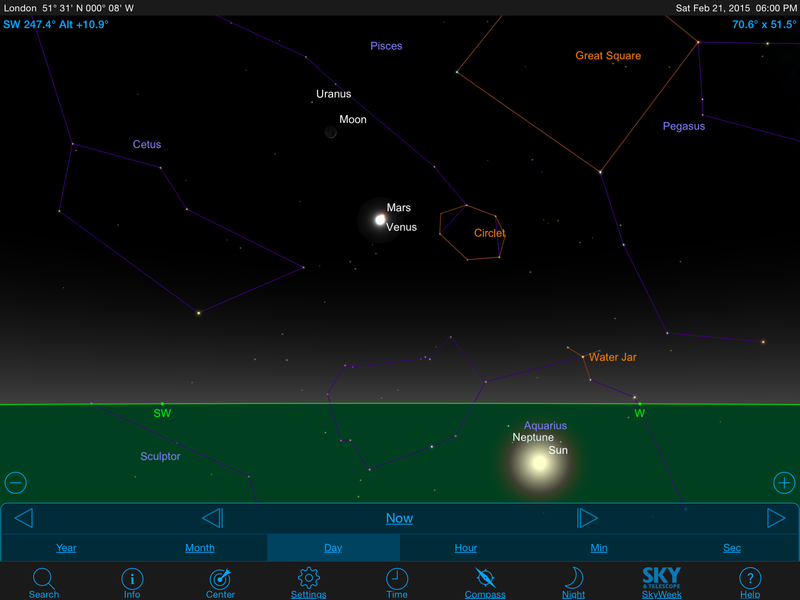 Venus, for anyone who has been looking at the evening sky of late, is very very bright at the moment just after sunset. Mars, on the other hand, is much fainter, but knowing it is close to Venus this next week to ten days will help you find it. 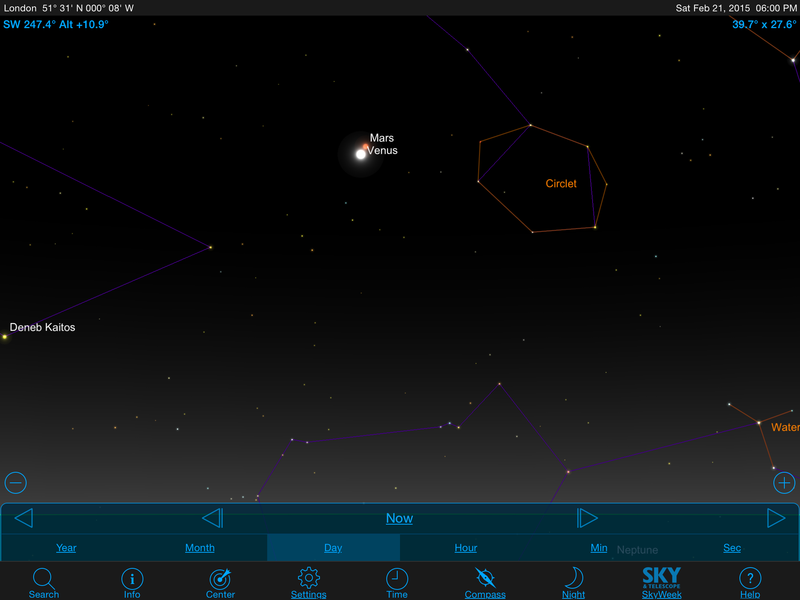 The diagram below, which is a screen capture using SkySafari on my iPad, shows the sky at 6pm (18:00) as seen from London on Monday the 16th. As you can see, Venus is very bright and Mars is much fainter, at about 11 o’ clock to Venus if you imagine the face of a clock. 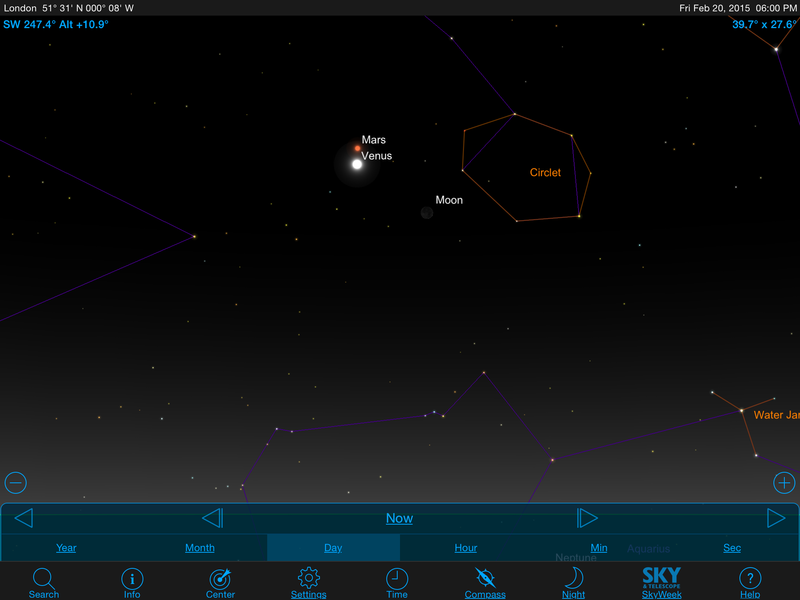 The positions of Venus and Mars at 6pm (18:00) on the evening of Monday the 16th of February, as seen from London. Both planets are currently in Pisces, and Venus is approaching the brightest it can be. It has a magnitude of this week (for an explanation of the magnitude system, see my blog here). Mars, as is obvious from the diagrams and if you look yourself, is much fainter; currently , making it times fainter! A magnitude of makes Mars easily visible, but it doesn’t jump out at you like Venus does. The positions of Venus and Mars at 6pm (18:00) on the evening of Thursday the 19th of February, as seen from London. 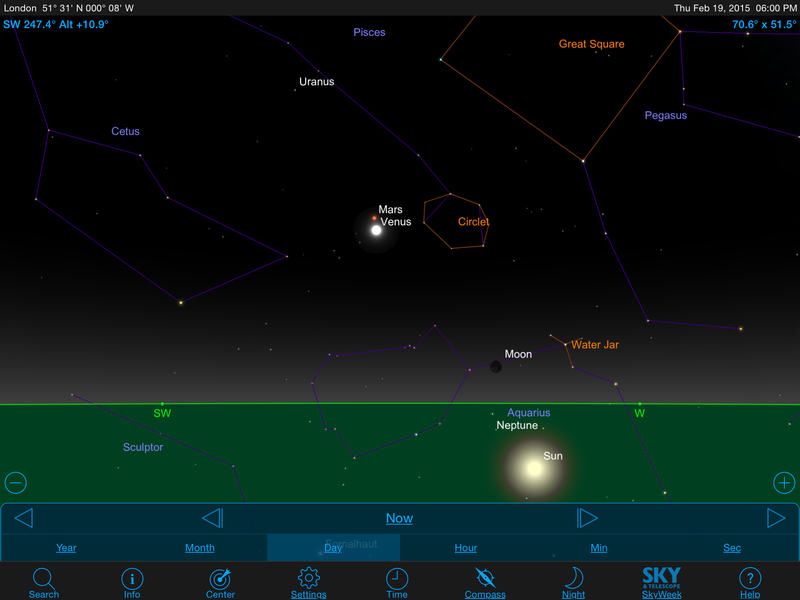 The positions of Venus and Mars at 6pm (18:00) on the evening of Friday the 20th of February, as seen from London. The positions of Venus and Mars at 6pm (18:00) on the evening of Saturday the 21st of February, as seen from London. To the naked eye, Venus and Mars will not be separable, but through binoculars or a small telescope you will be able to see enough detail to be able to see the small angular distance between them. One of the theories for what the star of Bethlehem was (if it existed at all, and assuming it was not supernatural), is that it was a triple conjunction of Mars, Jupiter and Saturn. Modern sky simulation software has allowed us to show that this happened in 7 B.C., but it shouldn’t come as any surprise to anyone who knows their history that Jesus could not have been born after 4 B.C. because that is the year King Herod died. A conjunction between Venus and Jupiter, the two brightest planets, can be very spectacular. Last week, as part of the “tech hour” on BBC Radio 5’s “Afternoon Edition” on Wednesdays, I heard one of their reporters do an item on visiting a facility in Australia which is trying to track space debris and locate their positions precisely. After the item a listener asked about geostationary orbits, and it was clear from the reporter’s answer that he did not really understand them. Then again, if he is not a trained physicist or engineer, why should he? In the light of the wrong answer given to the listener by the reporter, I’ve decided to blog about satellite orbits to clear up any confusion, and also to show that the mathematics of it is not that hard. This is the kind of problem that a student studying physics would be expected to do in their last year of high-school here in Wales. Mark Thompson, one of the astronomers who has appeared on BBC Stargazing Live, did clear up some of the confusion when he came on the programme later in the same hour, but he did not have time to go into all the details (nor would he want to do so on a radio show!). For those of you not familiar with the terminology, a low-Earth orbit is typically just a few hundred kilometres above the Earth’s surface, which as I will show below leads to an orbit about the Earth which takes a couple of hours at most. These are the kinds of orbits which are used by most spy satellites, and also by the International Space Station (ISS) and, when it used to fly, by the Space Shuttle. The famous Hubble Space Telescope is in a low-Earth orbit. Any satellites in low-Earth orbits will experience drag from the Earth’s atmosphere. Space “officially” begins at 100km above the Earth’s surface, but the atmosphere doesn’t suddenly stop at any particular altitude,it just gets thinner and thiner. In fact, the “scale height” of the atmosphere is about 1 mile, or about 1.5km. For each 1.5km altitude, the amount of atmosphere roughly halves (based on pressure), so at an altitude of 3km the air is as thick, and if you go up to 10.5km which is roughly the altitude at which commercial aeroplanes fly, then the thickness of the atmosphere is about as thick, or of the thickness at the ground. Even though the thickness of the atmosphere a few hundred kilometres up is very very thin, there is still enough of it to slow satellites down. So, satellites in low-Earth orbits cannot maintain their orbits without some level of thrust, otherwise their orbits would just decay and they would burn up in the atmosphere. 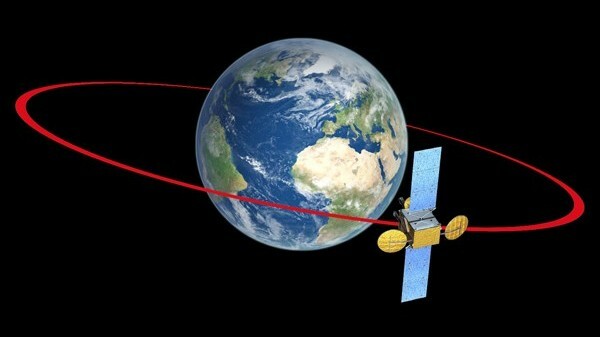 Low-Earth orbit satellites can be in any orbit as long as it is centred on the Earth’s centre. So, for example, many spy satellites orbit the Earth’s poles. If you think about it, if they are taking about 90 minutes to orbit (some take less, they will be even closer to the Earth), then each time they orbit they will see a different part of the Earth, which is often what you want for spy satellites. The ISS orbits the Earth in an orbit which is titled to the Earth’s equator, so it passes over different parts of the Earth on each orbit, but it is not a polar orbit. A satellite cannot, for example, orbit, say, along an orbit which is directly above the tropic of Cancer, and satellites do not orbit the Earth in the opposite direction to the Earth’s rotation, they all orbit the Earth in the same direction as we are rotating. Geostationary orbits, on the other hand, are a particular orbit where the satellite takes 24 hours to orbit the Earth. So, as seen by a person on the rotating Earth, they appear fixed relative to that person’s horizons. Geostationary orbits are used for communication satellites so that, for example, your TV satellite dish can be fixed to the side of your house and point in the same direction, as the satellite from which it’s getting the TV signals stays fixed in your sky. They are also used by Earth-monitoring satellites such as weather satellites and satellites which measure sea and land temperatures. A geostationary satellite has to be at a particular altitude above the Earth’s surface, and it has to be in orbit about the Earth’s equator (so it sits above the Earth’s equator), and of course orbits in the same direction as the Earth’s rotation. How do we calculate the altitude of these respective orbits, the low-Earth and the geostationary ones? It is not too difficult, as I will show below. To make the mathematics simpler, I will do these calculations assuming a circular orbit. In reality, some satellites have elliptical orbits where they are closer to the Earth’s surface at some times than at others, but that makes the maths a little more complicated, and it’s not necessary to understand the basic ideas. where is the mass of the object moving in the circle, is its speed, and is the radius of the circle. where is the mass of the Earth (in this case), is the mass of the satellite, is the radius of the orbit as measured from the centre of the Earth, and is a physical constant, known as Big G or the universal gravitational constant. which is roughly 36,000 km. It surprises most people that geostationary satellites are so far above the Earth’s surface, some 36,000 km. There is no atmosphere at that altitude, so geostationary satellites really pose no threat in terms of man-made space debris. Their orbits will not decay, as there is no atmospheric drag. It is the low-Earth orbit satellites which are the source of our man-made space debris, and if their orbits are not maintained the orbits will decay and they will burn up in the Earth’s atmosphere. Of course, most satellites entering the thicker parts of the atmosphere burn up completely, but larger satellites have been known to have parts of them survive to hit the Earth’s surface. For example this is what happened to the Russian space station MIR when its orbit was decayed by switching off its thrusters. The time it takes a satellite to orbit the Earth is entirely dependent on how far from the centre of the Earth the satellite is. Low-Earth orbit satellites orbit the Earth in a matter of hours, many less than two hours. Geostationary satellites have to be about 36,000 km from the surface of the Earth in order to take 24 hours to orbit. All satellites orbit the Earth in the same direction as the Earth is rotating, except for satellites in a polar orbit which essentially allow the Earth to rotate below them as they go around the poles. Geostationary satellites have to orbit above the Earth’s equator, but other satellites can be in an orbit which is inclined to the equator, as long as the centre of their orbit is the centre of the Earth. Finally, coming back to the issue of space debris; one of the reasons that space debris is so dangerous to other satellites and astronauts is that objects in Earth-orbit are moving very quickly. For example, for an object taking 90 minutes to orbit the Earth, such as the orbit the ISS is in, we can work out how quickly (in metres per second) it is moving quite easily. so, nearly 7,740 m/s or 7.7 km/s or nearly 28 thousand km/h, which by anyone’s standards is FAST! (or 30 Mega Joules). This is a huge amount of energy, because the object is moving so fast. By comparison, a car, which we will assume to have a mass of 1,000 kg, moving at 100 km/h will have a kinetic energy of , or nearly 0.8 Mega Joules, so about a factor of 40 (forty!) less than a 1kg object in low-Earth orbit. This is why such small objects can cause such damage! I have discussed meteors several times before, for example here and here. But, just so this background information is all in one place, I’ll repeat myself. A meteor is simply a bit of (natural) space debris which enters into the Earth’s atmosphere. Before it enters the Earth’s atmosphere it is called a “meteoroid” (or, a really big one would be called an “asteroid”), but upon entering the atmosphere a meteoroid becomes a meteor. The reason a meteor appears bright is because it is burning up in the Earth’s atmosphere due to friction. Most meteors are very small, no larger than grains of sand, but about once a day something the size of a basketball enters the atmosphere, and about once a week something about the size of a car. Larger and larger meteoroids are less and less common, so for example something the size of the meteor which exploded over Chelyabinsk in southern Russia last year (which is thought to have had a size of 17-20 metres as it entered the Earth’s atmosphere) probably enters the Earth’s atmosphere once every 50 or so years. The larger the meteor, the longer it will take to burn up, so most meteors (the sand-grain sized ones) burn up in less than a second. A “meteorite” is a meteor which makes it to the ground, or at least of which fragments make it to the ground. So, for example, the meteor which exploded in the atmosphere over Chelyabinsk in February of last year (2013) led to several fragments landing (as I discussed <a href="“>here), and these fragments are meteorites. Not surprisingly, it is only the larger meteors which make it to the ground as meteorites, although precisely what size a meteor needs to be to make it to the ground as a meteorite depends on a number of things including the composition of the meteor, the angle at which it enters the Earth’s atmosphere and the speed at which it enters the Earth’s atmosphere. As I’ve also mentioned before, there is now strong evidence that it was the impact of an asteroid (remember that is just the name we give to large meteoroids) which wiped out the dinosaurs and most of life on Earth some 70 million years ago. Although the statistics are very paltry and therefore unreliable, we believe the Earth gets hit by an asteroid large enough to cause a mass-extinction event about once every 150-250 million years. Although undoubtedly rare, such events are cataclysmic to life on Earth, and so it is not wasted money to spend time and resources looking for such large “near Earth” objects. The naming convention is quite simple, they are named after the constellation from where the meteors appear to emanate. 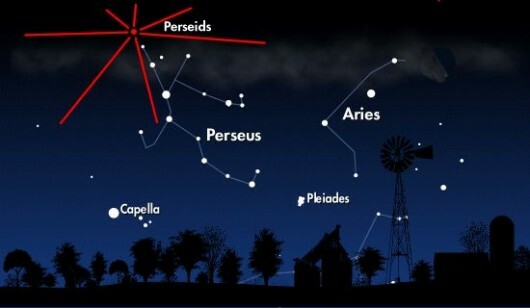 So, for example, the Perseids meteor shower in mid-August appears to radiate from the Perseus constellation, as this figure shows. The best way to see a meteor shower is not to use a telescope or binoculars, but rather to just look up with your eyes. Although when traced back they appear to emanate from a particular part of the sky, they can appear anywhere and using a telescope or binoculars will restrict your field of view, leading to your possibly missing a meteor. Lying on one’s back on the ground (or a rug or mat preferably; or reclining in e.g. a deck chair are very effective ways to view a meteor shower. But, be warned that if you are observing one in the winter months it will probably get pretty cold, so have some warm clothes and blankets with you, and a warm drink. Also, meteor showers are best viewed after midnight. This is because after midnight your particular part of the Earth is facing in the direction of the Earth’s motion about the Sun, and so the meteoroids enter the atmosphere at a steeper angle with a higher speed, and are more numerous than earlier in the night. The image below shows a wonderful image of the Geminids meteor shower, taken in 2012. A wonderful image of the Geminids meteor shower, which occurs each December. 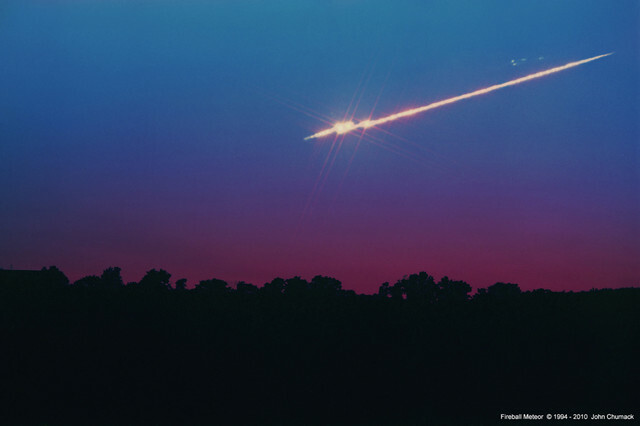 If you are very lucky you may see an extremely bright meteor, which is called a “fireball”. I have never seen one, but I have a story of how much luck is involved in seeing one. One November, when I was working at Yerkes Observatory, we arranged a public viewing of the Leonids meteor shower. Several of us working at the Observatory were out for a few hours with members of the public, and we saw several dozen small meteors. But nothing spectacular. My boss had been in his office working all evening, not taking part in our public observing. He lived in George Ellery Hale’s old house (the Observatory’s “Director’s House”), which was all of 2 minutes walk from the Observatory, and at about 9pm he popped home for a break from his work. As he walked the 150 metres or so to the house, he saw a great big fireball streaking across the sky, and the rest of us all missed it as we were inside warming up with a hot drink! The Perseids meteor shower is in mid-August, and is one of the most popular meteor showers as it occurs during the Northern Hemisphere summer when many people are on their summer holidays and away from city lights. If you get a chance to observe it this year, I highly recommend it, but bear in mind that you do need to be in a dark place. Most meteors are quite faint, and you will miss all but the brightest ones if you are in a city. 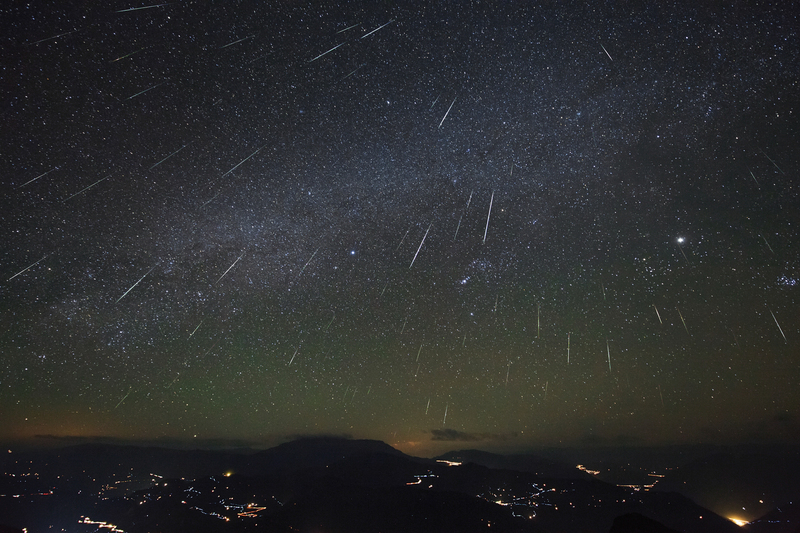 Which is the most spectacular meteor shower you have seen? Have you ever seen a fireball? There has never been a Tarzan audition quite like this! 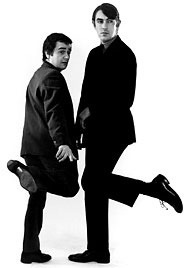 Enjoy Peter Cook & Dudley Moore in this hilarious sketch. Which is your favourite Cook & Moore sketch? As I blogged about here, Wales beat England in the title decider of the 2013 6 Nations. Not only did this deny England the Grand Slam, but it also won Wales the Championships because Wales won by more than 7 points. In fact, we won by 27 points! It was the biggest winning margin with which Wales have beaten England in the history of games between the two countries. Wales beat England in Cardiff by a record margin of 30-3. I was in Liverpool for the weekend, having given a talk to Liverpool Astronomical Society on the previous evening. I decided to watch the match in my hotel rather than risk trying to find a pub showing it, in case the pub-goers of Liverpool were tuned into some other sporting event. Here is a video I took at various points in the match, including the singing of Hen Wlad Fy Nhadau by the Welsh fans before the match. The Millennium Stadium in Cardiff had the roof closed, which added to the level of noise in the Stadium. Many commentators have said that they have never experienced an atmosphere like it at a rugby game. I have already posted a couple of sketches from Rowan Atkinson’s 1986 one man show, here and here. 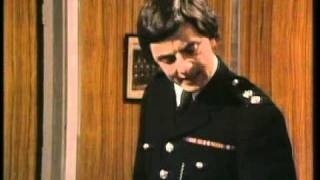 Today I thought I would post this wonderful sketch from Not The Nine O’Clock News, which launched his career. In this sketch, Constable Savage is played by Griff Rhys Jones, one of the co-stars of Not The Nine O’Clock News (along with Mel Smith and Pamela Stephenson). This sketch is pretty self-explanatory, it was a parody of the criticism the London Metropolitan Police was subject to in the late 1970s and early 1980s of institutionalised racism. 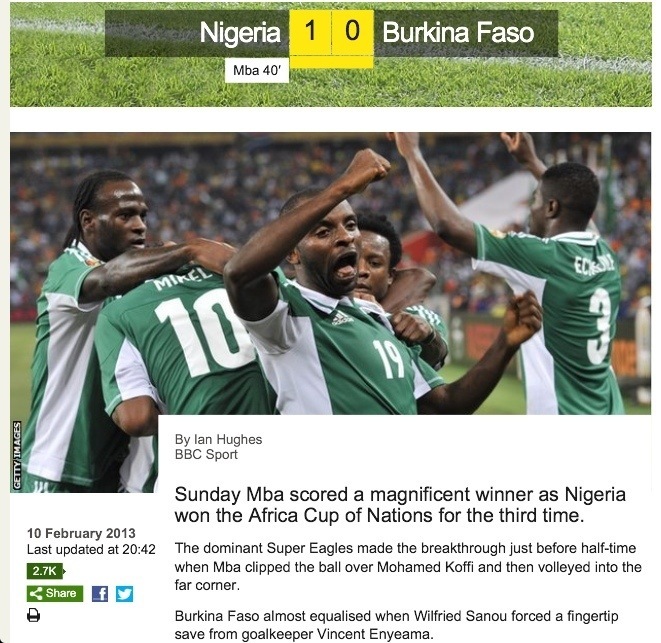 The 2013 Africa Cup of Nations was won by Nigeria (the Super Eagles), beating Burkina Faso 1-0 in the final. 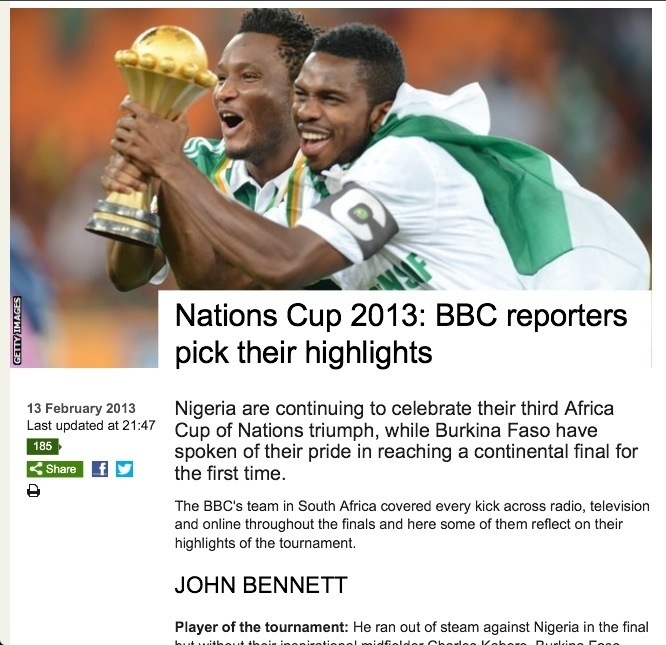 This is the 3rd time that Nigeria have won this competition, which started in 1957 and is held every other year. Burkina Faso’s previous best was coming 4th in 1998. In reaching the final, Nigeria beat Mali in one of the semi-finals, Burkina Faso beat Ghana in a penalty shoot-out in the other semi-final. In the 3rd place play-off, Mali beat Ghana 3-1. This may be the first time that all 4 teams reaching the semi-finals have all come from West Africa, and in fact all 4 are very close to each other geographically. When I was growing up in the 1970s, I do not recall any awareness of African football. The only other part of the World outside of Europe which got any attention was South America, and of course back in those days the great players like Pele did not play in Europe, they played their club football in South America. But things have changed. Europeans are now used to seeing African footballers, many of the best footballers playing in Europe in the last 20 years come from Africa. Didier Drogba, who was instrumental in my team Chelsea’s successes over the last several years, is from Côte d’Ivoire (Ivory Coast). Such has been the growth of African football and the interest in it in Europe that this year’s tournament had every match live on the sports channel Eurosport, and many of the matches were also shown in the Disunited Kingdom on the Freeview channel ITV4. With most English Premiership teams having several African players in their squads, the standard of football in the Africa Cup of Nations is very high, probably only surpassed by the standards in the Euro football championships and in the World Cup. Looking at the list of countries who have reached the final four of the Africa Cup of Nations since its inception in 1957, one can see that football spans the entire African continent. Past winners include Egypt, Morocco, Cameroon, Zambia and South Africa, every corner of the continent. it just shows that football truly is the global game.